Although I'm not a big fan of gingerbread, and often make substitutions for molasses in a recipe, I went ahead and baked Faith Durand's Dark Molasses Gingerbread Cake anyway. And I'm so glad I did because it's spectacular! The rich dark color and complex flavor of the cake comes from blackstrap molasses, an ingredient I had never heard of, but was found on the shelf of my local grocery store. The frosting is not your standard cream cheese frosting at all. It's cooked, ultra creamy, not too sweet, and dramatically white in contrast to this dark cake. 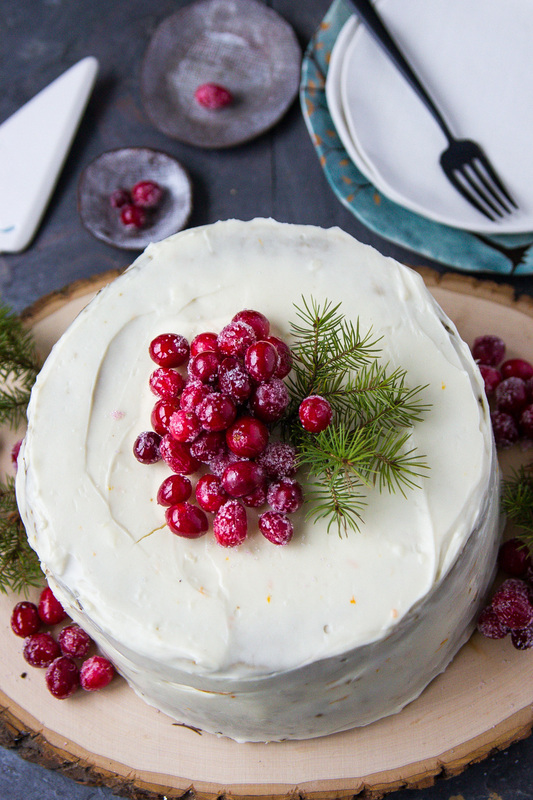 I used sugared cranberries, completely edible and very simple to make, (see recipe below), as a festive decoration. Preheat oven to 350F. Butter two 8inch round cake pans. Put the butter in a saucepan over medium heat. Pour in the molasses, add sugars, and whisk as the butter melts. Once melted and the sugar is dissolved, give it a final stir, then take it off the heat and set aside to cool. Using a dry whisk, combine the flour, salt, baking soda, ginger, cinnamon, and cocoa powder in a large bowl. Add the vanilla, eggs, and milk into the saucepan with the molasses and melted butter and whisk to combine. Slowly pour this liquid into the bowl of dry ingredients. Whisk to combine, making sure there are no lumps. Then, pour the batter into your prepared pans and bake 35-40 minutes or until a tester inserted into the center comes out clean. Let cool in pans for 20 to 30 minutes, then run a thin knife around the inside of the pan to help the edges release. Remove from the pan and let it cool completely before icing. Using a stand mixer or hand held electric mixer, whip the cream cheese on high for several minutes until it's completely smooth. Transfer to a bowl and set aside. Whisk the flour, sugar and salt together in a small saucepan. Turn the heat to medium and add the milk, whisking constantly. Whisk vigorously, smoothing out the lumps, to create a smooth paste. Continue to whisk as the mixture comes to a simmer; the mixture will thicken quickly when it comes to a boil. Simmer the mixture for a full minute, then turn off the heat. Scrape the flour and milk paste into the mixer bowl and whip for 10 minutes until lightened and lukewarm or cooler. Slowly add the whipped, softened cream cheese, beating constantly. Add the vanilla and orange zest and continue to whip until the mixture is smooth and silky. Let the icing firm up in the refrigerator before re-whipping it briefly on high and using it to frost the completely cooled cake. This cake freezes nicely. Combine the water and sugar in a small saucepan and bring to a boil, stirring to dissolve the sugar. When boiling, add the cranberries and remove from heat. Cover the pan and allow the cranberries to steep for 15 minutes, then strain the cranberries from the syrup. Discard the syrup or save it for another use. Spread the cranberries in a single layer on a wire mesh rack, discarding any that may have burst and allow to dry for 30 to 60 minutes. Pour the sanding sugar into a shallow pan. Add the cranberries and stir them around to coat with the sugar. Makes 1 cup. Can be doubled.